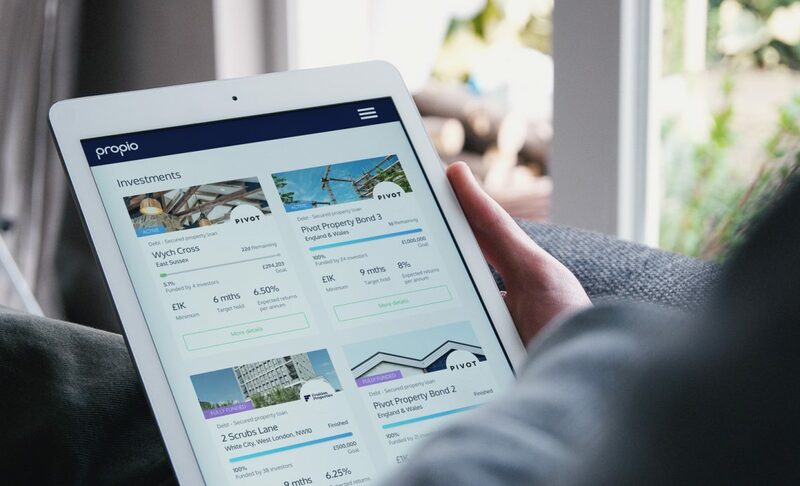 We are delighted to announce the launch of Propio, alongside short-term lender Pivot, a new property investment platform offering returns of 6-15%. Founded by an expert team, Propio offers a range of debt and equity opportunities all linked to development, with a low £1,000 entry point that will appeal to those who historically would have been unable to directly invest in property. The new platform aims to attract everyone from high net worth investors to pensioners and tech-savvy millennials. This includes those who are unable to get onto the property ladder and are interested in investing in property as an alternative to traditional cash ISAs, with potential returns that are up to ten times higher. Users log into the platform and allocate money either to specific projects or to a selection of pooled bonds which invest in multiple opportunities. The website includes in-depth information about the investment opportunities, complete with independent valuation information and an explanation of the project’s timeline. Investors get their money back when loans are repaid or developments are sold, with the duration depending on the type of project and on whether investors have taken a debt or equity stake. As Propio focuses on developments that have already obtained planning permission, delays are less likely and returns are more predictable. Taking an equity stake in a project – the highest risk option – could potentially earn a return of up to 12-20 percent per year. However, equity holders are always the last to be repaid, which is why returns are highest. Debt investments – where money is lent to developers but secured against the asset – typically return around 6 percent. This type of return is also substantially higher than those offered by traditional property funds – which typically seek an income yield around 4 percent with the rest made up by capital growth. Propio has been road-tested over the past year an expert team of developers and industry experts. The company believes investors deserve better transparency around property investment, which is often seen as very opaque and plans to be more open – and competitive – than others which often apply a multitude of fees for transactions and management. Every venture is also personally invested in by Propio’s own directors, giving investors peace of mind that they are making a prudent decision. Propio is on a mission to make property investment and fundraising easier and fairer than ever before. Not only do they offer exciting property investment opportunities on their online platform but they also support the companies who are building much needed new homes and workspaces in the UK.